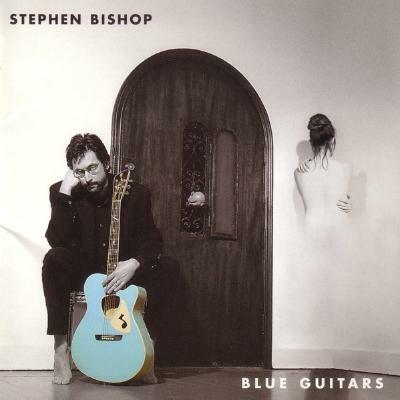 What I love about Stephen Bishop is his unusual sense of melody. And he's just a phenomenal songwriter. He wrote 'Separate Lives', he wrote 'Save It For A Rainy Day', he wrote 'On And On', [starts singing] 'Down in Jamaica, they got lots of pretty women/ Steal your money, then they break your heart...' I've got a funny story about that, actually. He was at a party and Rita Marley was there and she came up to him and said, 'What's all this stuff about Jamaican women stealing your money?' And she really got in his face. And he was like, 'Listen Rita, I've never been to Jamaica! It's just a song! I made it up!' And he was so scared he ran away and hid in the kitchen for the rest of the night. He's become a really good friend of mine. He co-wrote four songs on my new album and we'll probably keep writing songs together. Blue Guitars is a 1994 record, which was produced by Andrew Gold, and it feels to me like an Andrew Gold and Stephen Bishop record, because you can hear the relationship. It's completely different to what he normally does. They were really good friends, it was produced at Andrew Gold's house in California, and when you listen to it, it sounds like friendship. You can hear the friendship, and that's the most beautiful thing. But I couldn't decide between Blue Guitars and Bish. The album Bish is a big budget studio album, it's got Steve Cropper on it, Chaka Khan, great people. There's a picture of them all, I think they're called the Bishettes. It sounded like a real happening. What's weird about it, and probably why it wasn't successful, is that it's got these interludes from The Wizard Of Oz. He's done it as a sort of tribute to Yip Harburg, guy who wrote all the lyrics to 'Somewhere Over The Rainbow', 'Ding! Dong! The Witch Is Dead', etc, and is really responsible for that film being what it was. Every now and then on Bish, it goes, 'If I only had a brain...' Also, there's a song on there with Art Garfunkel on backing vocals, and I said to Stephen, 'I can't hear him, he's really quiet. Why is that?' And he said 'Oh, that's a really stupid story. Once, Art Garfunkel asked me to sing on one of his songs, and he turned me down in the mix. So I did the same to him.' It's so childish, and of course now he thinks that was really stupid. Art Garfunkel covers a lot of his songs. Art Garfunkel is probably his biggest fan.